All The Bananas We Eat Today Are Genetically Modified From ONE Single Banana! When you buy a banana at the store, it doesn’t seem to contain any seeds. How does the banana tree reproduce, then? If you went out into the wild and opened a banana fruit, you would probably find seeds. Some, in fact, are large and take up much of the fruit, making the flesh hard to eat. Our commercial bananas (which are, for the most part, the Cavendish variety) have been specially bred over the years so that they are seedless triploids (three sets of genes, instead of just two) that do not form mature seeds. Every single Cavendish banana is genetically EXACTLY the same. They are all clones, descendants of one single banana. If you’ve noticed little black dots in the middle of the banana, you’ve discovered immature seeds that won’t develop, which happens with triploids. Instead of using seeds, commercial banana trees are reproduced by using banana pups. The banana tree forms rhizomes that form into a little tree known as a pup that can be removed and planted elsewhere. Which means, they’re all sterile, and each new banana plant has to be manually planted from a cutting of existing banana roots. This genetic homogeneity is of course quite risky. If a parasite or disease becomes particularly adept at infecting the Cavendish, they could all be affected very quickly. Something that has happened before. Up to the 1950s the most common banana was not the Cavendish, but the Gros Michel (also known as Big Mike). So maybe it’s not just old people being old and curmudgeonly, maybe it’s true that bananas were tastier back then. However, the Gros Michel was wiped out by a fungus, fusarium oxysporum to be exact, which caused Panama disease. The fungus attacked the roots of banana plants and was also resistant to fungicide. To compound the problem, all Gros Michel were identical clones, therefore they were all as susceptible, causing to fungus to spread across plantations incredibly quickly. 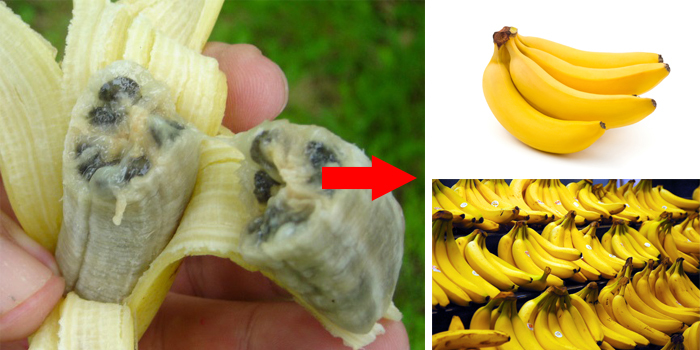 The Cavendish was chosen as a replacement, since it’s resistant to this fungus. However, it’s not resistant to the the black sigatoka disease, and a widespread infection is not outside the realm of possibility. First domesticated over 7000 years ago, bananas have been, over thousands of years, selectively bred to have really tiny non-fertile seeds. Wild bananas contain big, hard seeds and very little flesh. Have a look at the picture above. Without the genetic modification by selective breeding, bananas would be almost inedible. In fact, almost everything we eat has been modified by man in one way or another.